Win Creed: Step into the ring again | SWITCH. Adonis Johnson never knew his famous father, world heavyweight champion Apollo Creed, who died before he was born. Still, there’s no denying that boxing is in his blood, so Adonis heads to Philadelphia, the site of Apollo Creed’s legendary match with a tough upstart named Rocky Balboa. Once in the City of Brotherly Love, Adonis tracks Rocky down and asks him to be his trainer. Despite his insistence that he is out of the fight game for good, Rocky sees in Adonis the strength and determination he had known in Apollo, the fierce rival who became his closest friend. Agreeing to take him on, Rocky trains the young fighter, even as the former champ is battling an opponent more deadly than any he faced in the ring. 'Creed'' stars Sylvester Stallone, Michael B. Jordan, Tessa Thompson and Phylicia Rashad. The 'Creed' competition has now closed. Winners will be announced shortly. Competition opens at 5pm AEST on Sunday 3rd April 2016 and closes at 11:59pm AEST on Sunday 10th April 2016. Five winners will be chosen at random on Monday 11th April 2016. To successfully win, entrants must fulfil the above entry conditions before the time the competition closes. Current members/followers are eligible to enter the competition. Only one entry per person. Only one winner per household. To be a valid winner, the entrant must not have won a prize from SWITCH within the last 28 days. Each winner will receive one Blu-ray copy of 'Creed'. By entering, you agree to receive occasional emails from SWITCH in the future. If you decide to unsubscribe from these updates, any further entries will not be applicable. Only Australian residents are eligible to enter. 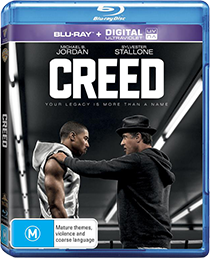 'Creed' is available on Blu-ray and DVD on Wednesday the 6th April 2016 from Roadshow.